The above info came from Lita Montoya, and was edited by yours truly (contact me). The image came from Amazon.com. For years, Japan was attacked by an alien race called the Heterodyne. In response, Earth started to build their own defense against the Heterodyne: a giant robot called Dai-Guard. But by the time Dai-Guard was finished, the Heterodyne had already disappeared, leaving Dai-Guard to become a tourist attraction as the years passed. Years later, in 2030, the heterodyne suddenly returned. 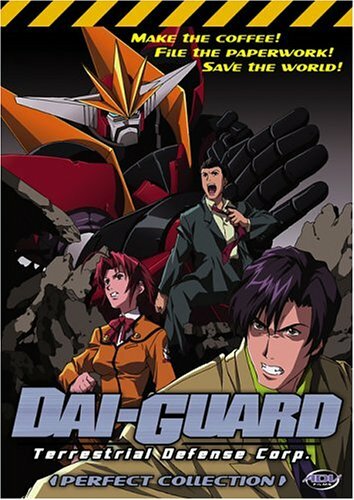 With Dai-Guard under the control of the 21st Century Defense Security, the army forbid them from launching the robot. Against their wishes, they trained three young office workers to Pilot Dai-Guard, giving them the task of keeping not just Japan, but the world, safe. When they're not out saving the world, Akagi Shunsuke, Aoyama Keiichirou, and Ibuke Momoi have to deal with paper work, and trying to get their work in on time! It's just what you have to do when your an office worker saving the world on a weekly basis. The above description came from Lita Montoya, and was edited by yours truly (contact me).